Seed pod or alien life form? While walking in a rural neighborhood along the eastern shore of Virginia, we came across these seed pods, attached to vines stretching across a grassy area with cedar and pine trees. The outside is thick and papery. On the inside are gelatinous white seeds. Plant ID apps weren’t helpful. Any idea what kind of plant this comes from? Can you post a pic of one cut in half? Or a photo of the vine/leaves? There are native Passion flowers (passiflora spp.) in that area, and exotic non-hardy species can sometimes grow enough to set fruit in one season. Anyway, that could roughly match the outside and description of the inside, as well as the location and viney habit, but I’m not at all confident without more pics/info. I don’t have any of the vine or leaves but here is the inside. "The Maypop is the State Flower of Tennessee." See if this looks right. If not that exactly, some kind of Passionflower. The flowers are completely convincing as alien life forms. Yeah it's an unripe passionfruit/flower. 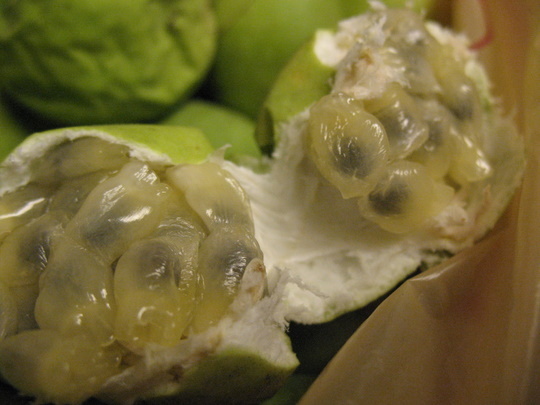 Yep, with the inside guts, pretty sure it’s a maypop. The flower and fruit are both edible, the leaves can be used to make tea which is a sleep aid. Some people also smoke the dried leaves ymmv. Roots easily from cuttings, if you’re inclined to have some around your house.